If you think so, you aren't alone - complaints and conspiracy theories are all over the internet. This goes to the core of the biggest question right now for technology investors: will Apple's customers upgrade their phone, or will the 'iPhone Supercycle' fizz. US$3 trillion is riding on the answer. Has your iPhone slowed since you updated? Discussion boards have been filled with complaints since the new update became available a month ago. Phones seem slower opening apps, apps are crashing, and some report the phone freezing. Many users are also finding their battery life is shorter after the update. The following chart shows the trend of Google searches for these issues. Conspiracy theories resurface every time Apple updates its operating system. Is Apple slowing down your phone intentionally so that you have to buy a new one? The answer is no … and yes. 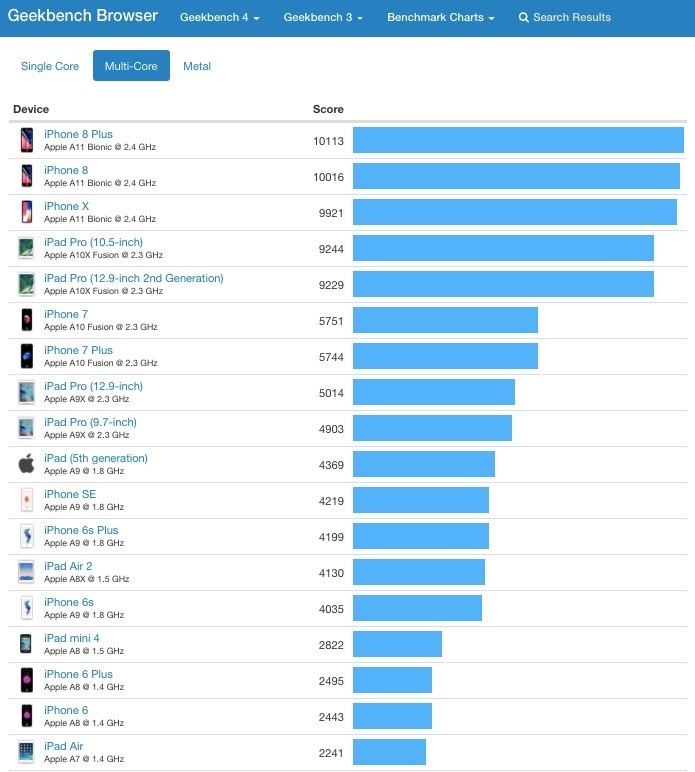 No, they aren’t slowing it down - tests show that your phone’s processors work just as fast on each new version of the software, so there is no funny business with the software throttling older iPhones. But yes, your phone is much slower as the operating system and the apps themselves get more bloated with features and functionality. The complaints of slow phones are the highest since the 2014 update. 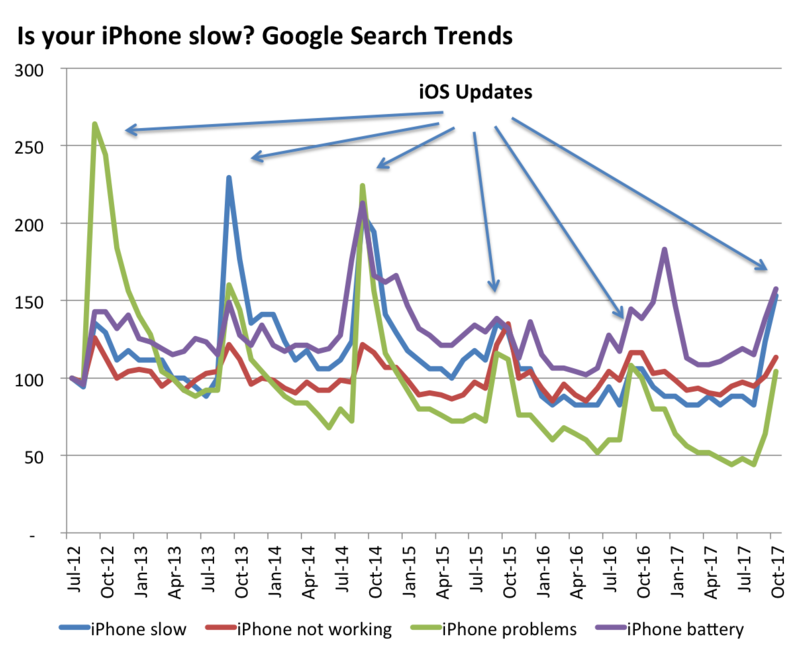 The trough to peak increase in Google search for “iPhone slow” is up 86%, 3x the prior two upgrades and similar to the 2014 upgrade. Its probably no coincidence that 2014 was the launch of the iPhone 6, the last major form factor change. The iPhone 8 and X have lots of new functionality such as 3D sensing and augmented reality features which use a ton of extra computational power. Apple's A11 chip is 25% faster at single threaded performance, and 80% faster at multi threaded performance than its A10 predecessor in the iPhone 7. Some report that it is even slightly faster than a 2017 model 13-inch MacBook Pro with an Intel Core i5 chip (though not nearly as fast as the fastest MacBooks). And if, like me, you have an iPhone 6 - an iPhone 8/X is 4x faster on multithreaded processing. It should be no wonder my phone seems slow. Will Apple's customers upgrade their phones? Apple dominated investor’s inbox this week, and it was all about this question. For a technology investor it is the single most important question, and even one of the most important questions for any global investor right now. It is important because Apple is the most valuable company in the world with a market cap of US$750 billion. It represents over 2% of the MSCI World index and 13% of the Technology index. And Apple makes most of its money from phones, with the iPhone to be roughly 2/3 of revenue directly in 2018 and more indirectly through services - the highest ever. Apple's reliance on the iPhone is growing, not shrinking. It is even more important than its market cap suggests as its direct component suppliers represent another US$1.2 trillion in market cap. And telecom companies, which depend on the iPhone to drive subscribers growth and plan upgrades, a further US$1.1 trillion. US$3 trillion all up. The market cap of the S&P/ASX 300 index is US$1.3 trillion. Will this be the iPhone super cycle that investors hope for, or will it fizz? Perhaps this means 2018 won't be an iPhone supercycle. For now that is how the market is voting. Apple shares are down 9% relative versus the S&P 500 Index since the start of September, and many of its suppliers are down 10-25% from peaks. Weak iPhone 8 sales should hardly be surprising as the iPhone X is the real upgrade. The 8 looks a lot like the 7 ... which looks a lot like the 6, the phone I have owned since 2014. The iPhone X is completely redesigned - it has an edge-to-edge screen which is larger than the 8 Plus even though it is a smaller device, and the screen is OLED which means it will be far superior. And it has 3D sensing, the two most interesting feature of Apple’s launch, allowing you to do things like unlock with Face ID and create animoji's (animated emojis). You should at least wait to see the X before deciding the iPhone 8 is ‘good enough’. Couldn't this be good news? It is interesting that the market is pricing weak iPhone 8 sales as bad news rather than good news. Weak iPhone 8 sales could be fantastic news for Apple and its suppliers if it means they will sell more iPhone Xs since the X costs 50% more and has more expensive components. Of course it could mean that users won't upgrade at all, but there is no evidence to support that thesis yet. Apple’s pre-orders start on 27 October and shipping on 3 November, so we don’t have too long to wait before we know the answer. My iPad is having issues after updating, making this the second iPad I have had that has become unusable after a software update. I will be upgrading it, but not with an Apple product. As they say, "Fool me once, shame on you, fool me twice, shame on me". My 4 year old Samsung phone has had no issues after software updates over the years, so my iPad will be replaced with a Samsung tablet.